Should I contact other providers before I open? I want to make sure I am charging the 'going' rate and not undercutting other day cares in the area. I also would like to network with the other providers, but am worried about their reaction. What do you think? Sounds like you are a new child care provider- Welcome aboard! I am happy to help you with your questions any time... so let’s get to it! To answer your question about what to charge, I would definitely check with your local child care resource and referral office. You will find this a valuable tool for your business. From my experience, many providers love this “sisterhood” because you can give each other guidance and support. Plus you will also build some wonderful friendships. 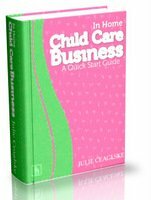 I ‘d like you to check out the landing page for my new book at In Home Child Care Business. A Quick Start Guide Read through the issues and mistakes so many people make. It is another valuable source for new (or old) providers that can help you become THE person people call and want to care for their children (and earn more income) plus answer many more questions you may have! Comments for Should I contact other providers before I open? The book was the best $15 I have ever spent on my business...and I have been in the business for 11 years!! I wouldn't be concerned at all about making anyone upset...most of us love to talk about what we do.